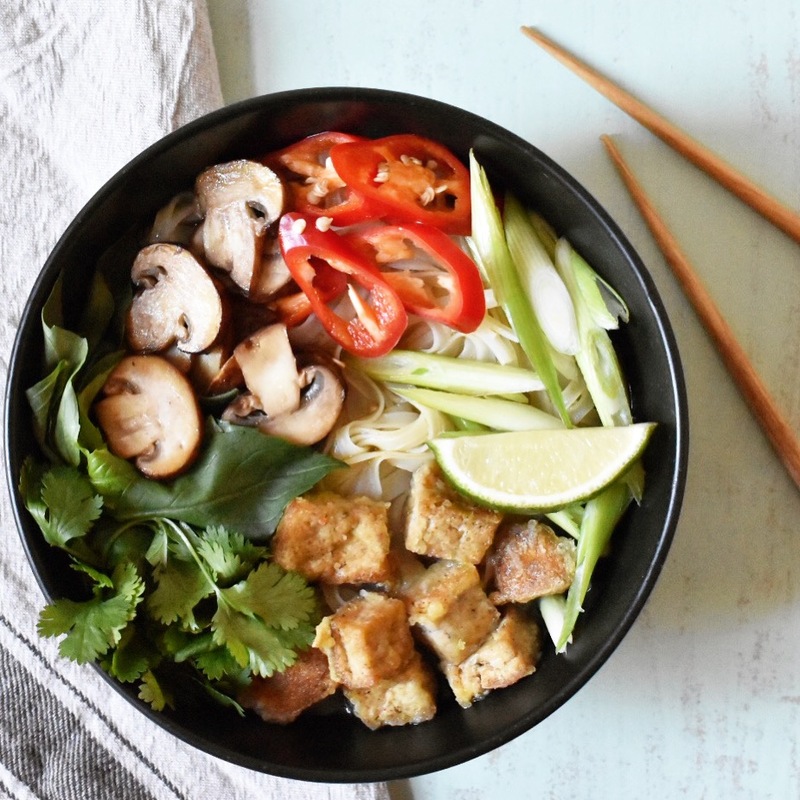 This vegan take on a pho is all about creating the delicious, fragrant, broth. I'd quite happily just drink a bowl of this broth on its own, but pack it with rice noodles and amazing toppings and it turns into a hot bowl of slurpy, warming, goodness. Traditional pho takes up to 10 hours to prepare, but I'd rather take this healthier, mega-quick, flavour-packed vegan version any day! (Tip - if you're just making this for two people, still make the broth for four. Just strain the liquid through a sieve and freeze for a rainy day. Then defrost and serve with fresh toppings for a quick mid-week meal). Start by making the broth. Simply chuck the stock, onion, garlic, ginger, star anise, cloves, cinnamon and soy sauce to a large pot and simmer gently with the lid on for about 30 mins. Meanwhile, prepare your toppings. Cube the tofu and gently toss with 1 Tbsp rapeseed oil and the cornflour, then scatter onto a baking tray and bake for 20 mins until crispy. Sauté the mushrooms in 1 Tbsp rapeseed oil in a hot frying pan for 5-10 minutes or until browned. Wash and chop the fresh herbs, spring onion, chilli, and lime. Cook the rice noodles as per packet instructions. Now to assemble the pho - divide the drained noodles into your serving bowls, then ladle in the hot stock (leaving the onion and spices behind). Now top with the crispy tofu, sautéed mushrooms, spring onions, chilli, fresh herbs, and lime wedges. There are some dishes that you'd imagine you could never have again after ditching meat, eggs, and dairy. Carbonara is one of them - traditionally made with lardons, eggs, cheese, and butter - surely this is a dish that's off the menu for vegans? Well, this vegan version takes on a slightly different (and in my opinion, better!) flavour, and it certainly provides a fix for any cravings you might have for a deliciously rich, creamy, comforting pasta dish. And swapping the traditional ingredients - laden with saturated fat and salt - with nutrient-packed plant foods, it's definitely better for your health too. To make the sauce, simply chuck the drained cashews, coconut milk, nutritional yeast, and seasoning into a food processor and blitz until smooth (a high-speed blender, such as a Nutribullet or Vitamix, blitzes the ingredients into the smoothest, creamiest sauce). Set aside. Now, cook the pasta as per packet instructions. Add the frozen peas to the pasta for the last few minutes of cooking. Meanwhile, heat the oil in a frying pan, and fry the mushrooms for 5 mins until starting to brown. Add the diced shallots, garlic, and tofu pieces and continue to fry for a further 5 mins. Now mix the drained pasta, peas, mushroom / tofu mix, and sauce all together in the pan, and serve! Sometimes you just need pasta in your life. And this is one of the best, most flavourful pastas I've had. It's also one of those great dishes that looks and sounds pretty impressive, but only takes 20 minutes to put together and so makes the perfect fall-back option if you're cooking for friends but find yourself tight for time. The key to this recipe is top quality sun-dried tomatoes - it's the star of the show here so splash out on some really top quality ones and this dish will go from good to freaking awesome. First of all make the parmesan. Literally all you do is tip the ingredients into a food processor or chopping attachment of a stick blender (not a high speed blender like a Nutribullet as they're too powerful). Blitz for a minute or so until the consistency is like sand or, well, grated parmesan! This will make a cup so you'll have lots to store in the fridge for 1-2 weeks and also goes great on vegan risotto or the ultimate vegan bolognese. 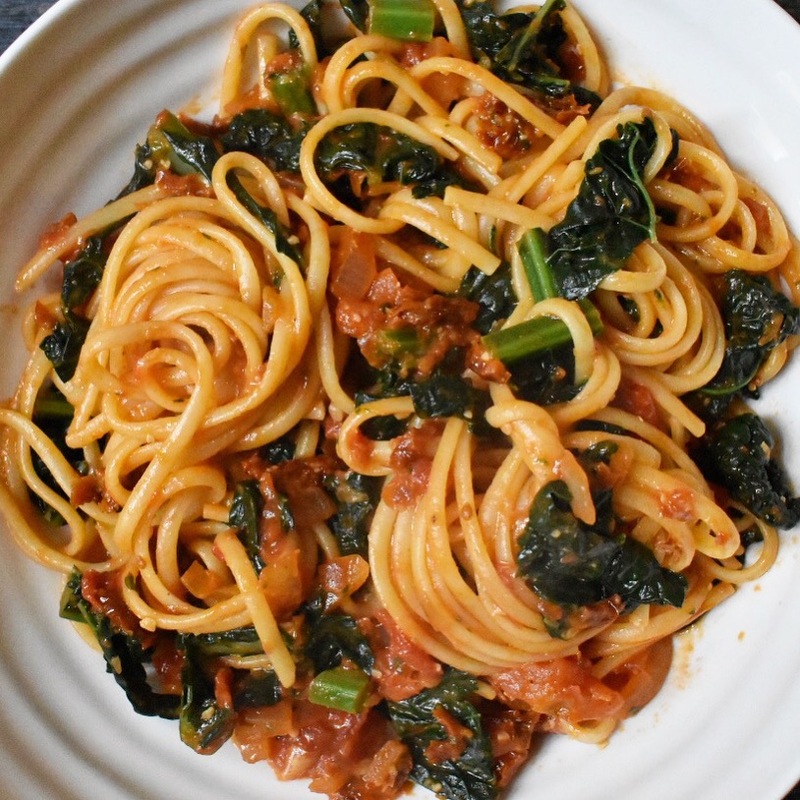 Now while making the pesto, cook your pasta as per packet instructions, adding the cavolo nero to the pasta for the last 5 minutes of cooking. To make the pesto, squeeze the sun-dried tomatoes to drain any excess oil. Add to the same food processor (no need to wash it after making the parmesan) and also chuck in the olive oil, basil, garlic, vegan parmesan, and tomato puree. Blitz this until it reaches a pesto-like consistency, although a few chunks of the sun-dried tomatoes left in there is nice in my opinion as it adds more texture. Once cooked al dente, drain the pasta and cavolo nero, return to the pan you cooked it in, and stir in the pesto. If you reserve some of the pasta water, you can add a little back now if you like the pesto a bit thinner. 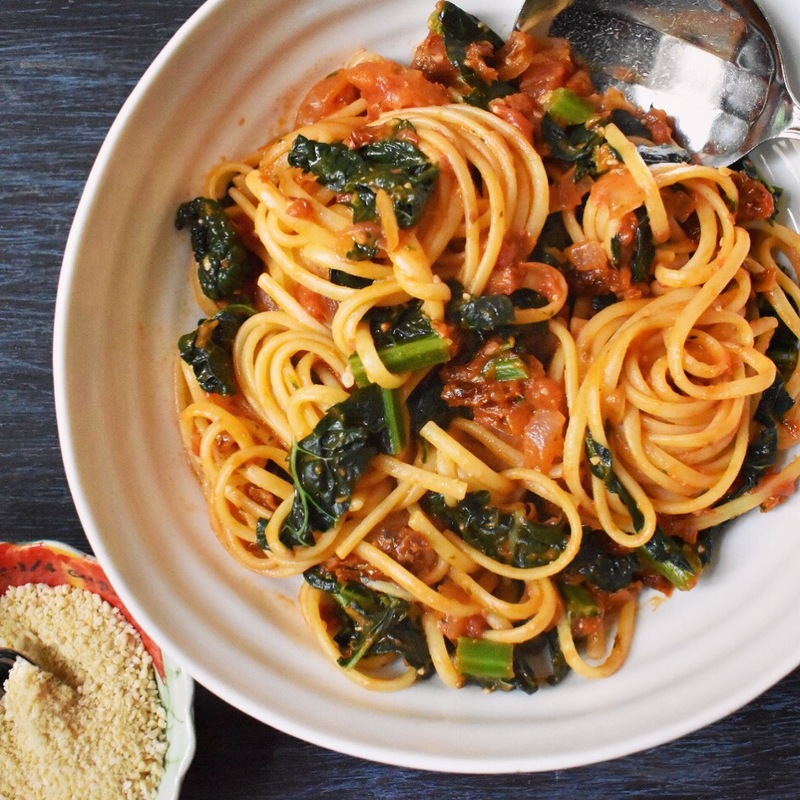 Serve into warm bowls and top with some extra vegan parmesan, torn basil leaves, and fresh ground black pepper. I've been experimenting with vegan chillies for years now - making loads of little tweaks and improvements each time, taking inspiration from several other recipes - and I'm proud to say this is definitely the best one yet.... It's a rich, deep chilli with a good spicy kick and complex flavours that rivals any meat-based chilli. The quantities in this recipe makes 8 servings, so use your biggest pan and freeze any leftovers - as with many dishes, the flavours actually become even more infused once defrosted and reheated. And check out the nutrition info below - one serving of this chilli with rice gets you close to half your daily needs for protein and iron, and all with less than a gram of saturated fat! Fry the onion and red pepper in the rapeseed oil over a medium-high heat for 5 minutes until starting to soften. Add the garlic, ginger, and fresh chilli and continue frying for a further 2-3 minutes. Then add the dry spices and fry for a further 1-2 minutes to release their flavours, stirring continuously. Now simply add all the remaining ingredients, but starting with just 1 litre of the stock, keeping the rest handy in case the chilli needs extra liquid. Simmer gently for 30-40 minutes until the lentils are tender, most of the liquid has absorbed, and the chilli is deep and flavoursome. The trick to take this chilli from a 9/10 to a 10/10 is to now remove just a couple of ladles of the chilli to blitz in a blender into a kind of sauce, then return this back to the pot - this gives the chilli a thick, rich consistency and helps to infuse the flavours even further. I like to serve with rice or just some warm crusty bread, any kind of dark green vegetable, and a dollop of avocado mashed with a squeeze of lime to help cool your mouth! 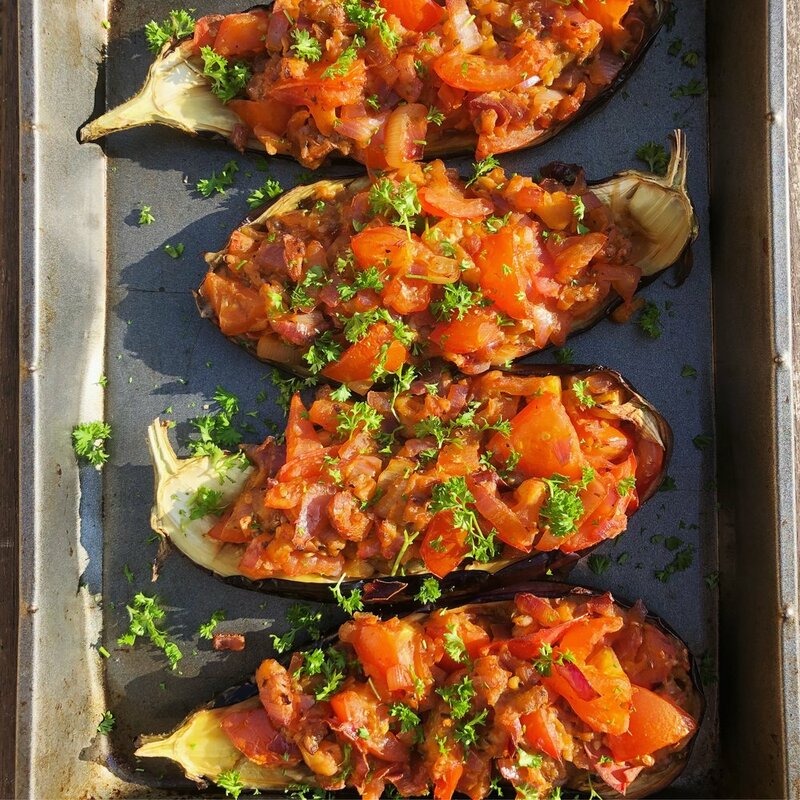 The summer is upon us, and if you've dusted off your barbeque and are now looking for inspiration for something AWESOME to cook on it, then this jerk aubergine (eggplant) is one of my all-time favourites. Served up with coconut rice and peas (which I would happily just eat on its own) to help cool the fiery heat of the jerk sauce, and nutty barbequed corn. You can use shop-bought jerk marinade if tight for time, or to make your own, simply chuck all the ingredients above in a food processor and blitz until a rough paste has formed (you may need to scrape down the sides a few times). 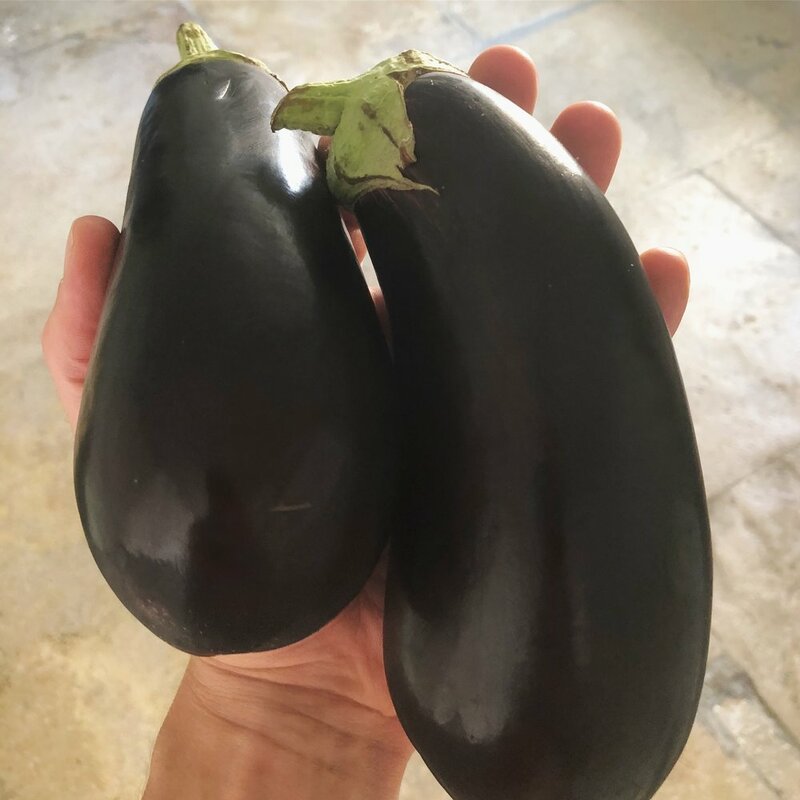 Now, chop your aubergines into 1cm-thick steaks, smother in the marinade, and leave to rest, ideally for a couple of hours. When ready to start cooking, preheat your oven to 180C and fire up your BBQ (or heat up a griddle pan if the weather's not so nice). Now, scrape most of the jerk marinade off the aubergines (otherwise the marinade will burn, but keep aside in a bowl). Lay the aubergines steaks on the hot BBQ / griddle - cook for about 3-5 mins on each side. Don't be tempted to move them around, so you get nice griddle lines across them. Once nicely charred, smother each steak with the jerk marinade again and pop in the oven while you do the rice and peas: rinse the rice under cold water, then tip into a pan with the coconut milk, spring onions, thyme leaves, garlic, and allspice. Add 300ml cold water and set over a high heat. Once it begins to boil, turn the heat to medium, cover with a lid, and simmer for 10 mins. Add the beans to the rice and put the lid back on for 5 mins, or until all the liquid is absorbed. While the rice is cooking, char your corn on the BBQ / griddle. Then serve the rice, aubergines and corn on plates, scatter fresh coriander over and serve with lime wedges. Reggae tunes obligatory! If you love the idea of foraging for food, but are worried about accidentally picking a poisonous mushroom or toxic berry, then nettles are a great place to start. Everyone knows what nettles look (and feel!) like, and they grow in abundance across the UK, Europe, and Western North America. And don't worry - once cooked, all the sting is taken out. It's a really delicious plant that can be used pretty much interchangeably with spinach in cooking, and packs a nutritional punch with loads of vitamins A, C & K, calcium, magnesium, and iron. They say the best things in life are free, and nettles are definitely one of those things - organic, seasonal, and all with no plastic packaging in sight! Using gloves, aim for younger nettles, preferably below knee height to get young, tender leaves. March and April are the best months in the UK but you'll find younger crops throughout the summer too, in patches where freshly seeded nettles have settled. Just pick the top four small leaves from each stalk as these will be the youngest / freshest, making sure just to pick the leaves and not the tough stalks. Don't pick any that are flowering - these will be tougher and we also want to leave flowers for bees and butterflies to feed on. And what better dish to add these delectable nutritious leaves to than my favourite lentil dhal dish, inspired by Anna Jones. This recipe produces one of the creamiet, richest, tastiest dhals I've ever tried, and as a plant-based curry lover I have tried a lot! First prepare your nettles. Keeping your gloves on, wash them in cold water, then drop them in a pan of salted boiling water and blanch them for 2-3 minutes, until completely wilted and resembling cooked spinach. Rinse them in cold water to prevent cooking them further and set aside. Now heat the oil in a large pan and fry the onion on a high heat for 5 mins until softened. Then add the garlic, ginger, and chilli and fry for a further 1 minute, stirring constantly to prevent burning. Now add the 4 spices and continue stirring for 1 more minute to release the oils and flavours. Add the coconut milk, lentils, and stock, and simmer for 25-30 minutes until the lentils are tender and the dhal is thick, creamy, and rich. Now add the nettles, then stir in the coriander and lemon juice just before serving. Goes brilliantly with steaming hot naan bread! You really don’t need Parmesan to make seriously tasty pesto! Flavoursome extra virgin olive oil, handfuls of fresh basil, nutty toasted pine nuts, and lots of powerful garlic make one of the best flavour combinations on earth. Tossed through some pasta with some simple veg like asparagus and cherry tomatoes, and you’re on to a winner every time. Such a simple recipe that keeps in the fridge for a couple of weeks or even freezes well for a mega-quick slap up dinner any day of the week. Ready for this? It’s pretty tricky so be prepared… Put all ingredients in a food processor, and blitz. That's it. Just whizz up until it's the consistency you like - I find it best when mixed until nearly smooth but still with some texture. I haven't cooked with tofu for so long and I don't really know why! Having made this, I remembered how amazing it can be - crispy on the outside, with the inside soaking up the delicious flavours of this fragrant, slightly sweet and spicy pad Thai sauce. I am often asked whether tofu is good for us - see my article about that here (the short answer is yes!). This is a version of a takeaway classic that it is infinitely healthier but still has all the flavour. So if you're ever craving a Thai takeaway, make this instead - it will be ready in less time than a delivery and you won't be left with that post-takeaway-gorging guilt (we all know that feeling). Start by making your sauce - simply mix all the ingredients in a small bowl. Now prepare your tofu. Take it out the pack and drain as much liquid as possible by gently pushing between your hands (being careful not to damage the block). Then slice into 2cm cubes. Prepare the rest of your vegetables now too, to save time during the quick frying process. Heat 1 Tbsp of the oil in a wok and fry the tofu until golden and crisp on both sides, about 10 minutes, then put the cooked tofu in a bowl to set aside. In the same wok, add the remaining oil and fry the onion for 5 minutes until beginning to brown. Add the garlic, ginger, and chilli for one minute before adding the rest of your vegetables, and continue to stir fry on a high heat for 5-6 minutes. Meanwhile, prepare your rice noodles as per the packet instructions (this usually involves standing in a bowl of boiling water for about 3 minutes, then draining). Now chuck the tofu back in the wok, along with the noodles and the sauce. Stir everything together until completely combined, cook for 1 more minute, then tip into bowls, top with chopped fresh coriander and spring onions, and tuck in! This has to be one of the easiest and healthiest meals to make for a quickly knocked together dinner. Ideal for this post-festive period when we just need some easy, simple, tasty, and healthy food. It's great for using up leftovers and most of the ingredients are store cupboard staples so it's perfect for when you run out of fresh food and can't be bothered to run to the shops. Plus, of course, it's mega tasty, and as with all of the recipes on Meat Free Fitness, packed with protein! Prepare all of the ingredients before you start cooking, as you need high heat and quick cooking times for this recipe, so you won't have time to do it as you go along. Heat the rapeseed oil in a wok or large frying pan over a high heat. Chuck in the red onion and fry for 5 minutes until beginning to soften. Then add the garlic, ginger, and chilli and stir constantly for another 1 minute. Now add the pepper, peas, and black beans. Meanwhile, prepare the brown rice as per packet instructions, usually just around 2 minutes on full power (if using dry rice, cook this before you start cooking as per packet instructions). Then add the rice to the wok along with the spring onions, and stir to mix everything. Now stir through the soy sauce, sesame oil, and fresh coriander, and that's it - ready to eat! Christmas is only 5 days away, and if you're still deciding what to cook for your main event, look no further than this wonderful stuffed and roasted squash. It's packed with all things tasty and festive, and the flavours combine during roasting to develop this delicious, slightly sweet dish, that's got different textures and looks amazing sliced on your plates. Preheat the oven to 200C (390F). Cut the squash in half lengthways and scoop out the seeds with a spoon. Then score and scoop out some flesh to create a hollow gully for the stuffing along the entire lengths of each of the squash halves. Discard around half of the flesh and half of the seeds. Finely chop the remaining flesh and seeds and fry with 2 Tbsp of olive oil for 5 mins. 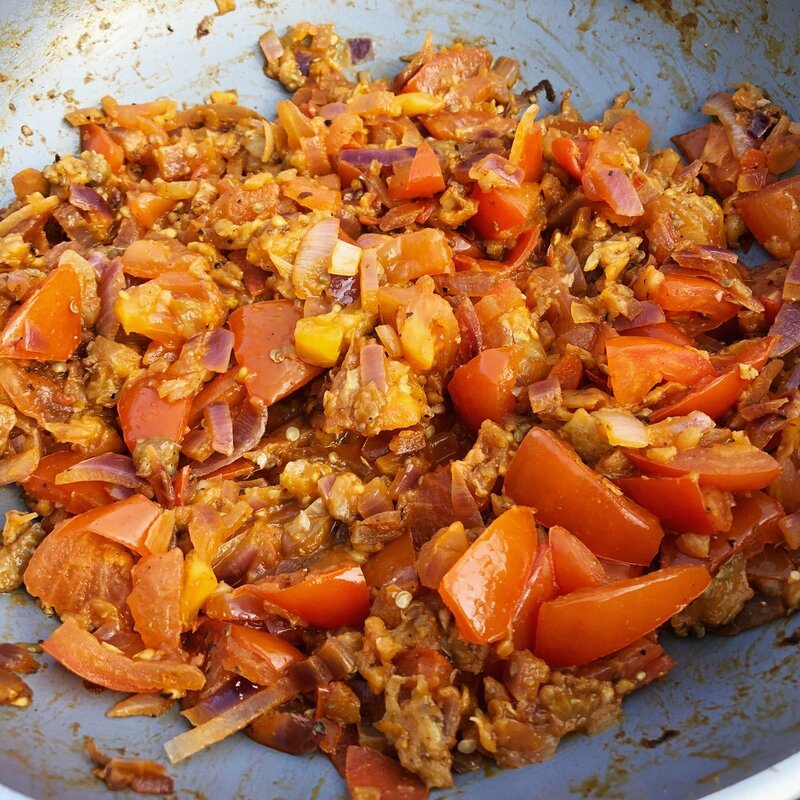 Add all of the remaining ingredients, stir thoroughly, and fry for about 10 minutes, until beginning to soften. Now, pack the mixture tightly into the hollows of the squash halves, then press the halves firmly back together and rub 1 Tbsp olive oil with some salt and pepper around the outside of the squash. Wrap the whole thing in tin foil, then place in the oven for about 90 minutes, or until tender and cooked through. To serve, open up the foil and carefully carve nice thick slices along with all the trimmings and gravy. Tip: It's personal preference whether to leave the skin of the squash on or not. 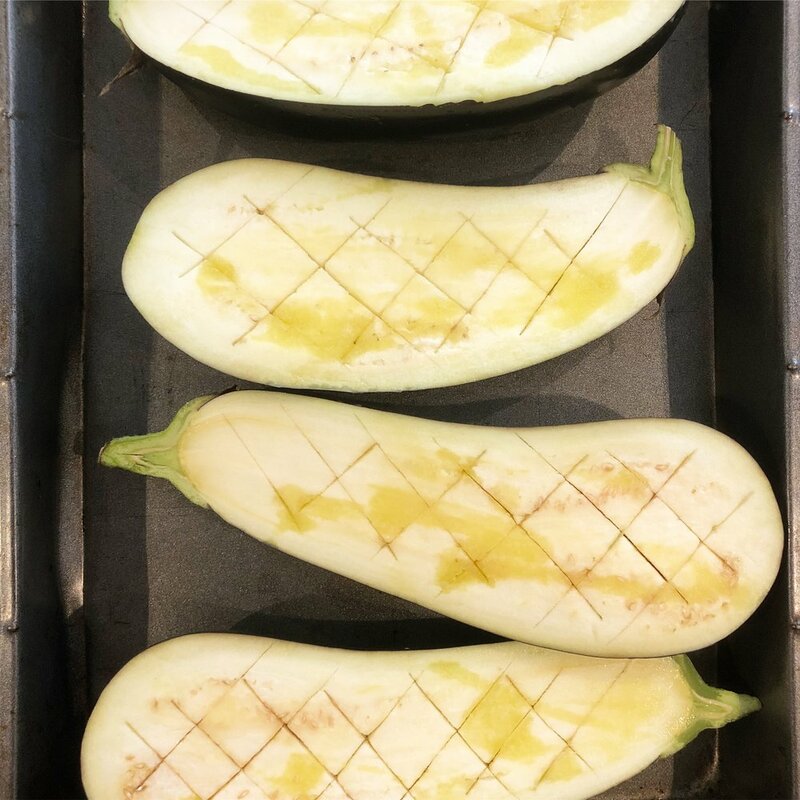 The skin of most varieties of squash will become nice and tender after 90 minutes of roasting, is perfectly edible, and will help to hold the shape of the squash together. Peeling the squash however can look better and means the texture is more consistent... up to you! This is one of my favourite soups and the perfect kind of food to be eating at this time of year - warming, hearty, and immensely nutritious! Tarragon is great addition; with its warming fennel-like flavours, it adds another delicious dimension to the flavour of the soup. This is a low calorie recipe that still packs loads of protein and iron. Plus it's just too quick and easy not to cook it! Heat the oil in a large cooking pot, then sauté the onion for 5 minutes, until beginning to soften, then add the garlic and continue to fry for a further 2 minutes. Next, add add the mushrooms and lentils, and cook until the mushrooms begin to brown. Meanwhile, wash the spinach in a colander. I like to take a few snips through the spinach with a pair of scissors as this prevents it from clumping together too much. Add the stock to the pan (try half of it at first, and add more if you like your soup more 'brothy') and chuck the spinach in and stir through until wilted. Next add the herbs (use half the tarragon at first as it can be overpowering if too much added). And that's it - so simple and easy. Rip off some chunks of crusty wholemeal bread to dunk, and your set to go!